In March 1981 we were heading back to Jersey on the car ferry from Weymouth, with quite a warm feeling inside. I was in the team which had just won the initial Home International Surf Kayaking Championships at Fistral Beach Newquay and as a result we felt that we were up for anything, so in the naivety youth of youth we hatched a plan to paddle from Jersey back to England. A Channel crossing but at the western end of the waterway, as opposed to the narrower and busier Dover Straits. Over the next couple of months the reality of the paddle began to sink in but we pressed on with the planning. 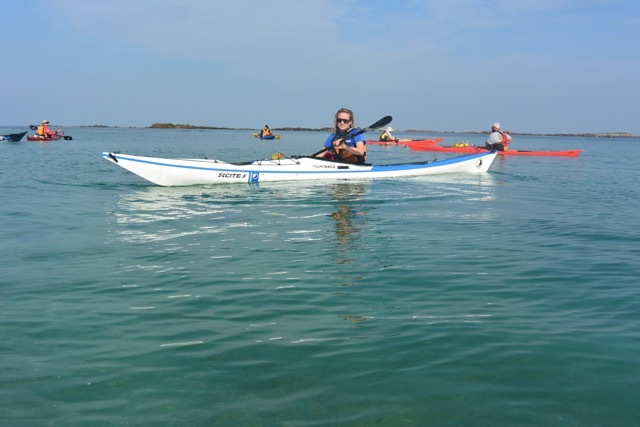 In the end we decided to split the paddle in Alderney. So early one Sunday morning in June 1981 five us loaded our sea kayaks on the beach at L’Etacq on the north west of Jersey and headed out, on our way to Alderney 33 nautical miles north, due to the speed of the tidal streams around Alderney our window of opportunity was quite small. So there was no time to hang about or to pop into Sark, as we passed by. In addition we were under added pressure as we had to catch a flight home in the afternoon. 6 hours after leaving L’Etacq we beached at Braye Harbour having made good use of the favourable tidal streams. We quickly stored the kayaks, rushed to the airport and in a matter of 15 minutes retraced our route back to Jersey, although with considerably less effort. The following Friday night we flew back to Alderney, retrieved the kayaks and rechecked our navigation for the following morning. We aimed to leave at 06.00 so it was an early phone call to the Jersey Met Office for a current weather forecast. It couldn’t have been better, virtually no wind, sunshine and the slight risk of a fog patch. How wrong this turned out to be. As we paddled out of Braye Harbour we disappeared into the fog and in the belief that it was a small fog bank headed north. Little did we realize that this fog stretched all the way to the south coast of England, 58 nautical miles away, if we known we might well have turned straight around and headed back to Alderney. We kept to our bearing but in the pre-GPS days there was no way of confirming our actual position we just had to have confidence in our compasses. At times the visibility was less than 50 metres, although the fog couldn’t have been that thick vertically, as the sun was shining. We decided to stop for lunch at 13.00 and as the top of the hour approached our thoughts turned to food. Suddenly at about 12.58 there was disconcerting rumbling sound to our right. Almost simultaneously John and myself shouted paddle as we had seen the bow wave. We were directly in the path of an enormous cargo ship, which was steaming west clearly unaware of our presence. As we sprinted forward we just cleared the ship. At this point fear kicked in. We decided that staying alive was preferable to stopping for food so we carried on north with an extra sense of urgency to our strokes. Amazingly at about 20.00 we popped out of the fog just underneath the old Borstal on Portland. I would like to claim credit for some seriously accurate navigation but I think that it was more by luck than judgement that we arrived at our destination with such precision. We landed on the beach at Weymouth just before 21.00 which gave us an average speed of nearly 4 knots for the previous 15 hours and we just missed the overnight ferry back home to Jersey. So it was an evening exploring the night life of Weymouth (very limited) before heading south on the British Rail ferry the following morning. It was an immensely satisfying paddle but whenever anybody asked since for advice I have always recommended that they don’t repeat our journey. Its not the distance but the risk of being exposed to the shipping something that it is impossible to imagine unless you have sat in the middle of the Channel. 36 years on I can still remember the feeling as if it was yesterday when that bow wave appeared out of the fog! Although I have taken photographs of sea kayaking since the 1970’s I have none of the Channel crossing, I was just to concerned about the paddling to stop and take any. An aerial shot of Alderney, with the harbour at Braye clearly visible. It was our arrival point from Jersey and departure point for England. The strong tidal streams, which Alderney is well known for, are visible running over the rocks off the tip of the island. Following on from some previous nostalgic postings, this one describes a paddle that Peter Scott and myself undertook in August 1989. The catalyst for the idea was the arrival of a sea worthy two man sea kayak on the market, the Aleut, designed by Howard Jeffs. The aim was a non stop circumnavigation of the Channel Islands, a distance of approximately 125 nautical miles. Just before dawn on an August Saturday we launched from Corbiere, the south west corner of Jersey. Heading along the south coast of the island until we were able to head out towards Les Ecrehous. We passed in between France and this delightful reef before picking up an energetic, north flowing tide, towards Alderney. The 30 nautical miles were covered in just under 5 hours. From the Alderney Race we passed to the north of Alderney before heading west towards the Casquets. There was a huge volume of water heading south, creating boils and overfalls, which added some spice to the paddle. Navigating only with a Silva compass as we passed the Casquets we were ahead of schedule and starting to feel slightly optimistic, after 9 hours on the water, that we would complete the circumnavigation. Unfortunately visibility wasn’t that great, and this was pre-GPS, so it wasn’t until we arrived off the northern tip of Herm that we realized we were east of our intended track. 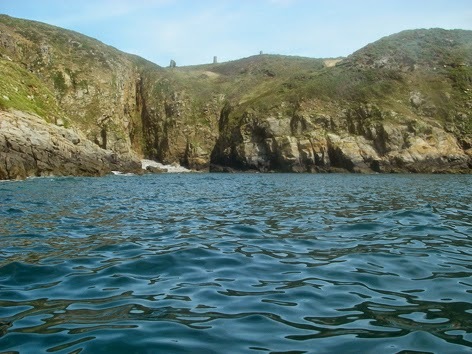 We had to cross the Little Russel and head back to the northern tip of Guernsey before starting down the west coast of the second largest island in the Channel Islands. 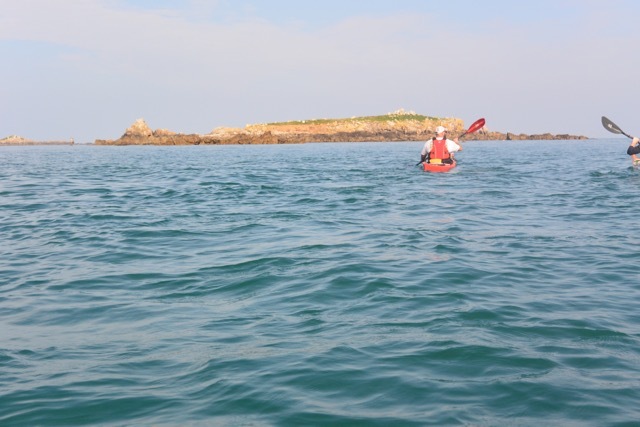 As we head south, after over 14 hours of sitting in the kayak and becoming mentally and physically tired we realized that the time lost heading south from the Casquests meant that we had missed the tidal window to cross from the Hanois back to Corbiere. Reluctantly we headed to shore, after having covered approximately 90 nautical miles. As we climbed out of the cockpits we discovered that our legs had decided not to work and had to crawl part of the way up the beach. Fortunately we had landed in front of a local pub so were able to revive our spirits as we called home to check in. The first contact for nearly 15 hours, this was pre-mobile phone as well as pre-GPS. As we recovered from the exertion of the day trip we were able to look at the route in an analytical fashion and learn from our mistakes, the plan was to return the following year and complete what we started but weather windows and time off didn’t coincide so it is an unfinished project, for Pete and myself at least. 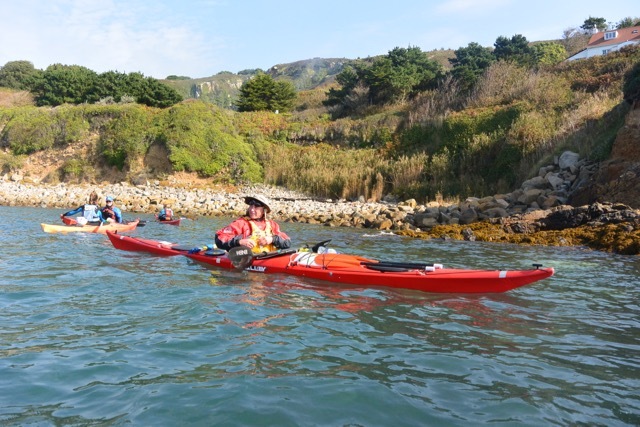 John Richardson and Ian Hamon finally became the first paddlers to complete the non stop circumnavigation of the Channel Islands in June 2000. This was taken on their arrival back at La Pulente. To this day there are the only sea kayakers to have completed the unsupported journey around the islands. Herm, is a delightful island, which lies several miles to the east of Guernsey across an interesting section of water, the Little Russel. Today is almost perfect conditions we were able to explore, not just the coast of Herm but the fascinating reefs to the north. A memorable paddle for the beginning of October. There were very strong tidal streams flowing in the Little Russel, which tested the groups navigational awareness and our moving water skills. Thankfully there was virtually no wind so we just had to focus on the moving water as we crossed to what is an absolute delightful destination at any time of the year. Jim just off La Rosiere Steps on Herm. 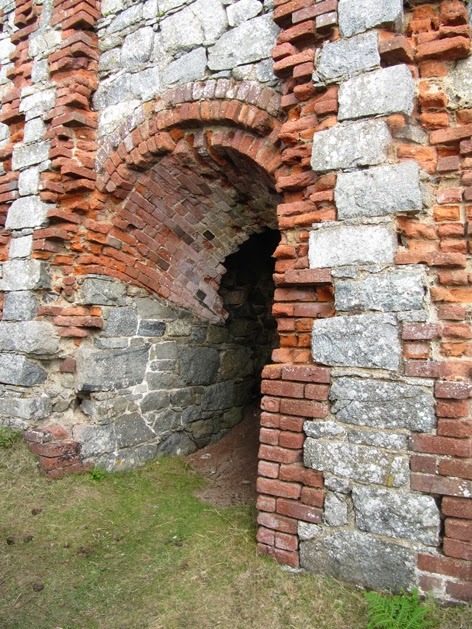 Once we arrived here we knew that we were out of the strongest tidal flow and we could relax to a certain extent. 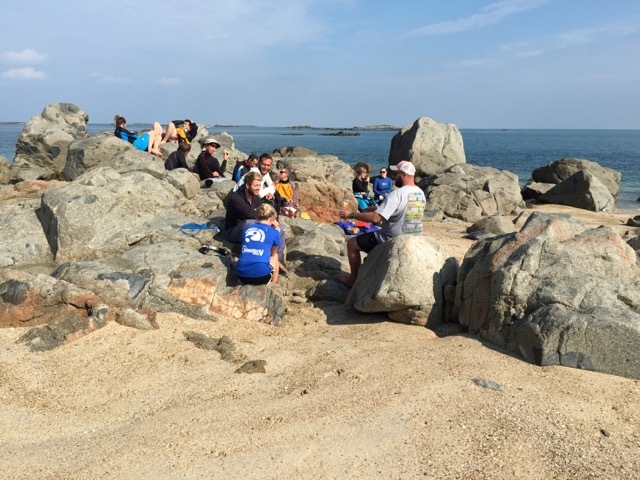 Lunch spot on the north east corner of Herm. Laurie off Shell Beach. The Humps are visible to the north. It is hard to believe that it is the fist weekend in October with conditions like this. Approaching Godin. 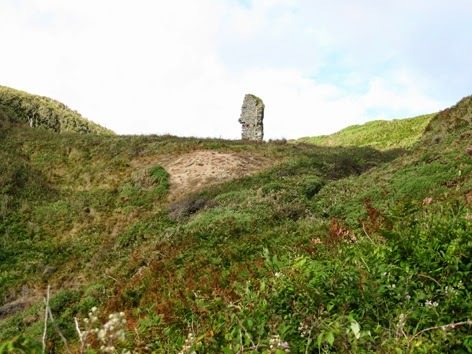 This small island is the largest of the Humps, a fascinating area to explore to the north of Herm. There are plenty of distinctive navigation beacons around Guernsey and Tautenay is no exception. It provided a convenient resting place whilst crossing the Little Russel, back to Bordeaux. Tidal diamonds are invaluable sources of information in relation to the speed and direction of tidal streams. They are essential when working out bearings to follow on a crossing, by drawing tidal vectors. Whilst away on a paddling trip earlier this year I came across, what must be an almost unique tidal diamond? It is Tidal Diamond C on Admiralty Chart 808, East Guernsey, Herm and Sark. The first observation is that the streams only flow in two directions, exactly opposite each other. The tide is flowing approximately SSW and then it changes abruptly and goes NNE. An exact 180° change. Something else to note is that maximum rate occurs at high and low water, with slack water, if it can be called that, occurring at mid tide. 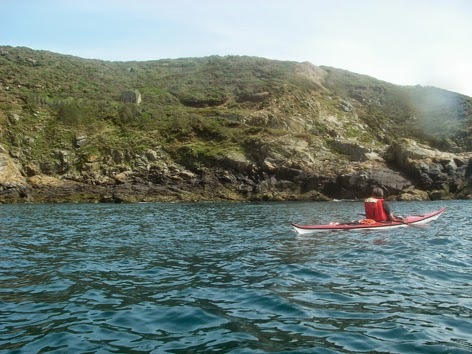 Many a sea kayaker and other water users have been caught unawares because they assume that maximum rate must occur at mid tide and have set out to cross the Little Russel on what they thought was high water slack. 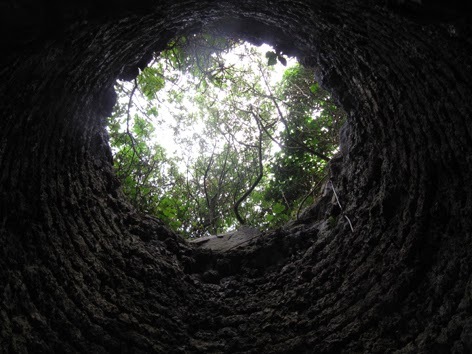 The advice is to always double check your data and to keep your eyes open for interesting and possibly unique items of information as shown by this tidal diamond. 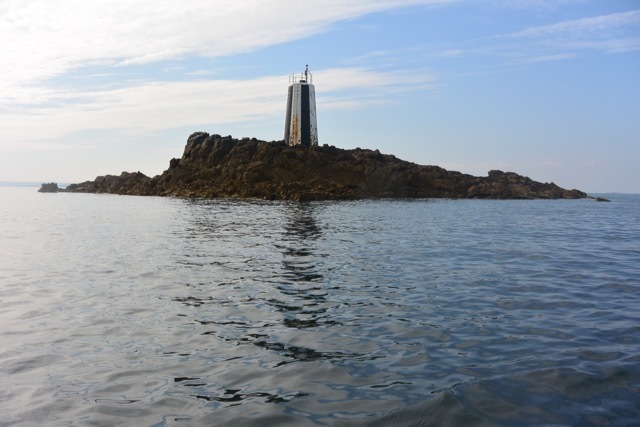 The location of the diamond is in line with the two towers on the photograph and to the right of Brehon Tower, which is in the middle of the channel between Guernsey and Herm, the Little Russel.